At a school where the average age of students is 38, delivering online education requires a unique combination of tactics. The average student at private, nonprofit Excelsior College has about 20 years of life experience over the typical undergraduate. Many students come with a hefty background in the military or other professions where they've picked up skills that deserve credit. 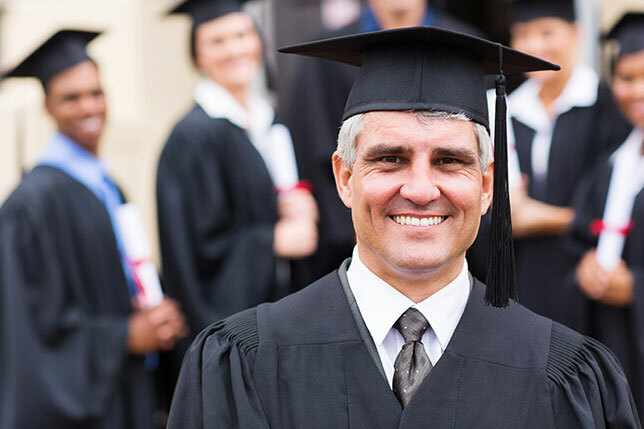 Recently, Excelsior president John Ebersole shared four lessons his online-only college has learned for helping adult learners succeed in earning their degrees. Excelsior was founded by the New York State Board of Regents in 1971, even then primarily serving the adult student. For several decades, Regents College, as it was known, never actually offered any instruction of its own; it performed assessments of what was already earned in college credits and helped students complete their degree programs by earning the remainder from other institutions inside and outside the state. Then in 2003, the school renamed and reinvented itself as a private, nonprofit institution delivering online instruction. Currently, 70 percent of Excelsior's revenue comes from online learning; the other 30 percent is still derived from the assessment business. As Ebersole explained, Excelsior follows the "HMO model of medicine." "What we are trying to do is minimize the costs to the student to the greatest extent possible," he said. When a candidate applies for admission, Excelsior tells him or her what can be accepted as prior academic work, including credit earned through military or other non-institutional sources. "And after we've found out how that maps to a New York-state approved degree, we'll show you where the holes are and help you find ways to fill the holes," whether through courses at Excelsior or another institution. "We often find that people are surprised at how short the task can be, because of so many different ways of learning that we're prepared to recognize and other institutions are not," he noted. Previously, the college charged an "enrollment fee" to do that credit audit, but last year, the fee was eliminated. Now the service is offered free. "We thought that was hurting people, that it was creating a barrier," Ebersole said. "Our job is to remove barriers." Of Excelsior's 38,000 students, 18,000 are studying in one of the college's nursing programs, which include associate, bachelor's and master's degrees. That's good and bad, according to Ebersole. On the good side, it shows that there are a lot of nurses with clinical experience who want to advance their skills, and the college has developed an approach that appeals to them. On the bad side, "Frankly, we can't accommodate all of the demand we have," he said. "It's time to get more capacity, because we're losing very motivated students who want to study this way." So the school is modifying its approach in several ways. First, it's increasing the size of classes. Although programs at the college typically have 25 students per section, nursing long maintained it at 20. "The fear was that 25 at one time might be too much," Ebersole reported. Now nursing sections too are stretching to that size. Second, the college is hiring more instructors and issuing more sections. But growing to fit demand is taking time. After all, Ebersole pointed out, 18,000 students divided by 25 students still totals 720 sections. Third, Excelsior is considering how to use simulation assessments as a replacement for its final clinical competency exam, which has been a bottleneck. "[The clinical competency exam] requires us going into real hospitals and doing real procedures on real patients," Ebersole explained. "You can't do better than that, but it's not scalable. We can only do about 2,000 of those a year. We have to accommodate the hospital. It's not easy to get a hospital that will allow us to do this. That's probably the biggest controlling factor. And getting PhD-qualified nurse educators trained in our process is also a limiting factor." According to Ebersole, the school has invested $100,000 in redesigning each of its nursing courses to make them "highly, highly interactive," building in simulations with videos and case studies. As those approaches prove themselves, Excelsior expects to be able to apply lessons learned to the clinical competency exam as well. Ebersole has seen the highs and lows of delivering compelling online courses. Among other postings, he was at John F. Kennedy University (now part of the National University System) in San Francisco when it became the first institution in the country to offer an accredited master's program online. At the University of California at Berkeley, he was involved in converting "paper and pencil courses" to an online program with money from the Alfred P. Sloan Foundation. When the completion rate of that program dropped from 47 percent to even lower, he learned a valuable lesson: "It's not about the content as much as it is about the instructional design. We had some terrific content, but it was dry as toast. People were bailing with great regularity." Since those days, he noted, "the whole profession of instructional design has really grown up. It has become the essential element in using technology well. Instruction and learning don't have to be a flat, boring, laborious affair. The degree to which we can make it interesting, if not entertaining, the more we're going to hold onto those students. Technology allows us to do that." For one, technology can deliver interactivity. "We learned long ago that there's a direct correlation between interactivity and student retention," Ebersole said. For another, Excelsior isn't relying overly much on video. "Showing streaming video isn't our idea of online learning," Ebersole stated. The college's preference is to provide audio with visual images and print. "It's not just a case of an instructor standing in front of the room lecturing and us videotaping and streaming it over the Internet. We think that's pretty primitive actually." Excelsior worked with a number of universities, including Boston University, Harvard and the University of Texas in launching Access to Learning, a site demonstrating how online learning can work. Although none of the specific examples are from Excelsior's own collection of simulations, the examples show a mix of photos, animation, onscreen text, video and interactive exercises. Using a mixed bag of techniques lets the school do "so much more," Ebersole explained. "What we want to do is stress the importance of interacting with the material. We want you to do online activities and exercises and prove to yourself that you're getting the material before you move on. We're going to assign problems to you and the expectation is that you're going to solve those problems, and then we're going to critique what you got and didn't get. In spite of having a 96 percent degree completion rate, the college still struggles to get students to move from one course to the next. "It's not that they drop out," said Ebersole. "It's that they don't enroll in it." Partly, he noted, with older students, there's always the "time issue" or the "money issue." The school has found that adult students prefer to study a single course at a time. But since students need to take two courses in a semester to qualify for any kind of federal financial aid, Excelsior delivers two courses in sequence. Faced with some "disappointing" course registration numbers, Excelsior tried a small change in its practices. As Ebersole explained, "Two to three weeks before the start of the term, if an existing student hasn't enrolled, they're going to get an e-mail reminding them and recommending what the next course might be. If they're a week out and they haven't enrolled, we call them. That seems to be having a positive impact." In fact, he added, by implementing those measures, "we've just blown the doors off of our course registrations for the second term." Ultimately, every aspect of Excelsior's operations is intended "to make the educational experience such a positive one that you're motivated to stay with it. The biggest barrier to adult-serving programs is lack of self-confidence on the part of students," said Ebersole. "So if we can get them to be successful in their first couple of courses, the likelihood of them staying with us just goes up dramatically."